Well, yes, I realize that the majority of people send their best wishes and yearly updates during the Christmas season instead of the Easter season, but, I'm still within the bounds of a liturgical season. I'm on night watch. It's just me, a calm sea, a light breeze, a starry sky and a string of tankers and container ships off in the distance. Perfect conditions for feeling contemplative and expansive. I sit in the cockpit under the broad sky and ponder my place in the universe. Then I shrink my perspective somewhat and think about my place in the Earthly scheme of things and from there it's only a small hop to thinking about all of you. During this past year we've sailed almost halfway around the world and have been to many beautiful and exotic places. I should probably catalogue them now and describe all the fun we've had and add a "meaner, neener, neener" or two, but I do enough of that already. I will say that the Tuamotus and Tonga are topping the list of our favorite spots so far. We stopped at Raroia in the Tuamotus which, FYI, is where Thor Heyerdahl ran Kon Tiki aground. I tried to impress the girls with the maritime and anthropological significance of his trip etc., I even suggested we could erect some kind of historical and geographical marker, but I was vetoed and they went snorkeling. I'll satisfy my need to educate by awarding bonus points to all who can locate Raroia on a map or name any of Kon Tiki's crew. The trip has affected each of us. There are probably profound changes in our personalities and outlooks, but the more immediate effects are interesting enough. Geoff is clean shaven these days. Somewhere in between our third and fourth tropical island groups he decided facial hair was too hot to endure. He keeps his hair shorter too. He says it's to impress port officials but I think it's about the heat. Claire has also decided that short hair is the way to go. She is slowly learning how to describe the ideal haircut in multi-lingual gestures. (She hasn't had any real disasters so far, but there was one cut we all were happy to see grow out.) Her dinghy driving skills have grown enormously. She'll plane the thing anywhere and any time. Don't let her talk you into a blind-folded dinghy race. Alex is a little upset because, frankly, she doesn't think she's grown any taller. She may not be taller, but what she is, is a closet daredevil. She'll feign concern over speed, but she's the one who will sit in the cockpit and watch the big rollers come from behind, fling her arms over her head and yell "Woo Hoo!" as the boat lifts and falls. She's also the one who would be directing Claire in the blind-folded dinghy race. Me? I'm a little blonder and a little tanner. And I can tell you that the binoculars are one of my favorite pieces of boat gear. They allow me to remain aware of my surroundings. I think when we get home I'll have to find a good place for them near our picture window. Just like Mrs. Cravitz. You can follow our travels on this web site . 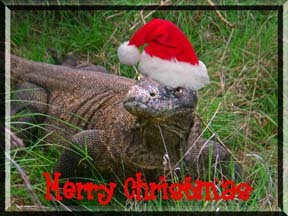 The picture of the Komodo dragon in the card above is one Claire took on Rinca Island in Indonesia. You have no idea how hard it was to get him to wear the hat. More bonus points if you can find Rinca on a map. The web site gets updated in fits and starts, but you'll find more pictures. We love to hear from you too. Please do keep in touch. In the meantime, I'll make wishes for you all on the shooting stars I can see on watch. Enjoy a happy and healthy 2008!